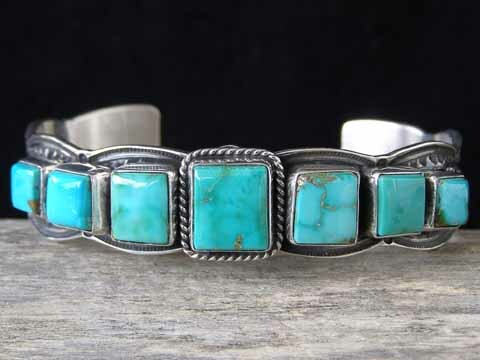 Guy Hoskie Royston Turquoise Graduated Row Bracelet size 6 3/8"
We initially made contact with Navajo silversmith Guy Hoskie in December 2005 when we bought some magnificent cluster pendants from him. We have continued to accumulate his work which is always made with fine natural stones. This seven-stone graduated row bracelet is set with rectangles and squares of natural, untreated Royston turquoise from Nevada. This is a nice combination of soft shades of blue and blue-green Royston turquoise polished to glassy smoothness. The stones are set in straight-edged bezels. Deep-stamped traditional stampwork further decorates the cuff and highlights this scalloped-edge cuff made from 14 gauge Sterling. The silverwork has a nice patina which gives it an old-style look and, though this looks like an antique, it is fresh from the hammer. Guy's hallmark consists of his initials "G" and "H" with the word "Sterling" stamped between the letters of his initials. Stones: center 7/16" x 3/8"; left & right 3/8" x 5/16"; middle left & middle right 5/16" x 5/16"; far left & far right 1/4" x 1/4"
Terminal to terminal: 5 3/8"
Total inside circumference (including gap): 6 3/8"